MyTriniGrocery Chief Roasted Geera :: Enjoy Chief Roasted Geera! Cumin is a flowering plant in the family Apiaceae, native from the east Mediterranean to East India. Its seeds, in ground form, are used in the cuisines of many different cultures. The flowers are small, white or pink, and borne in umbels. The fruit is a lateral fusiform or ovoid achene 4–5 mm long, containing a single seed. 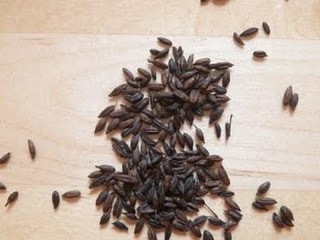 Cumin seeds resemble caraway seeds, being oblong in shape, longitudinally ridged, and yellow-brown in color, like other members of the Umbelliferae family such as caraway, parsley and dill. Cumin is the second most popular spice in the world after black pepper. Cumin seeds are used as a spice for their distinctive aroma, popular in Nepalese, Indian, Pakistani, North African, Middle Eastern, Sri Lankan, Cuban, northern Mexican cuisines, central Asian Uzbek cuisine, and the western Chinese cuisines of Sichuan and Xinjiang. Cumin can be found in some Dutch cheeses, such as Leyden cheese, and in some traditional breads from France. It is commonly used in traditional Brazilian cuisine. Cumin can be an ingredient in chili powder (often Texan or Mexican-style), and is found in achiote blends, adobos, sofrito, garam masala, curry powder, andbahaarat. Add it to the pot when you are 'chonkaying' your dhaal for that irresistable taste. Also tastes great with pickles, cabbage, all mexican dishes, curries, meat stews, select cheeses and tomato-based sauces and stuffing mixtures. Click the button below to add the Chief Roasted Geera to your wish list.